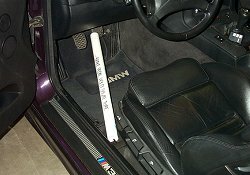 The M3 is driven to the events on street wheels and tires with the racing wheels and tires loaded in the back of the car or on a small tire trailer. Swapping from street wheels/tires to racing wheels/tires at the track before the event starts, and then back to street wheels/tires after the event is over can be a time consuming and tiring task. 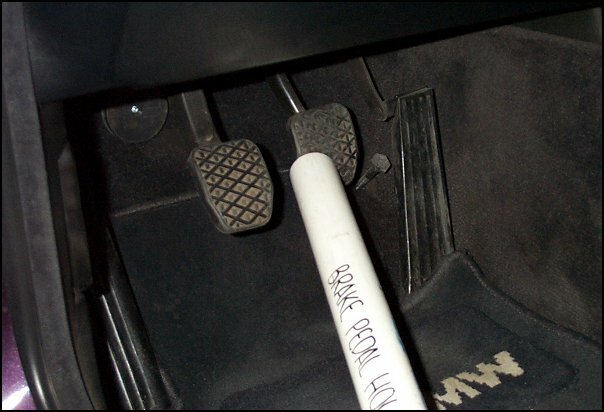 To make this task a little quicker and easier, a Brake Pedal Hold Down Tube ("BPHDT") is used to lock the brakes in place to allow lug bolt removal, wheel swap, lug bolt installation, and torquing all while that corner of the car is jacked up off the ground. 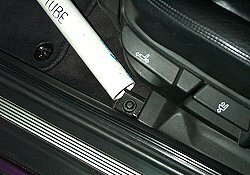 There is now no need to break all the lug bolts loose before jacking the car up, or to lower it down onto the ground before torquing the lug bolts. 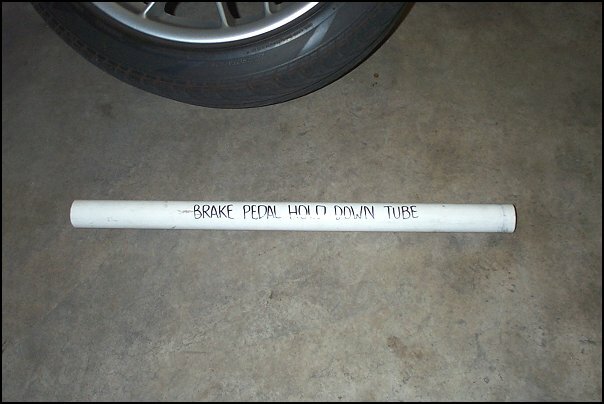 The BPHDT is simply just a piece of 1.25" high pressure PVC pipe cut to approximately 25" (actual length will vary with each car). The PVC material is inexpensive, lightweight, strong, clean, and easy to position. 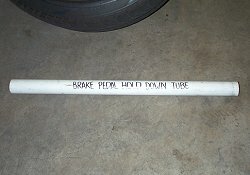 Alternatively, the BPHDT could be made from various other materials such as a wooden 2"x4", metal pipe, or other common household items. The BPHDT is placed into position so that it locks the brakes down to allow easier wheel/tire removal and installation. The great thing about using the BPHDT with a BMW is that with the key off the brake lights don't light up when the brake pedal is depressed, so you're not draining your battery if you forget to remove it immediately after you're done swapping wheels and tires. 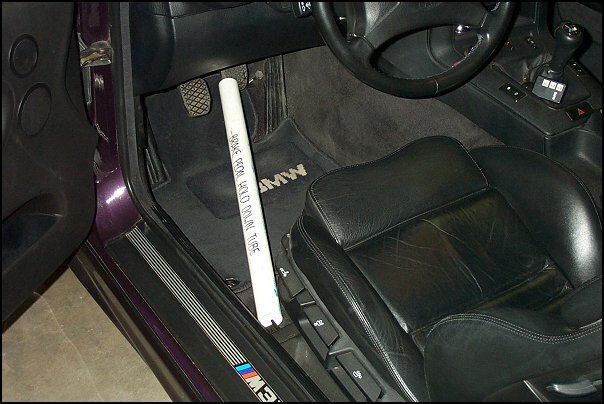 One end of the BPHDT is placed against the left side of the driver's seat frame. There is enough of a lip on that part of the frame for the BPHDT to hook onto and remain firmly in place. 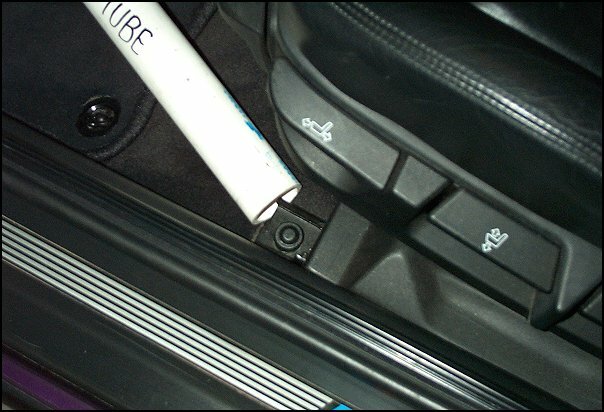 A similar location in other vehicles should be easy to find. 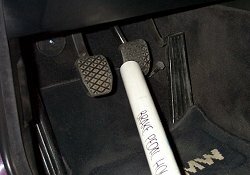 The other end of the BPHDT is positioned against the brake pedal (while fully depressed with your foot). The actual length of the BPHDT is determined by the distance between the car's fully depressed brake pedal and the spot on the seat frame (or similar location) that the BPHDT will be positioned against.